The same day a House of Representative Committee is meeting to discuss drone regulations, the FAA granted for companies licenses to fly drones in a commercial setting. (In September, the FAA granted seven licenses to film companies.) The most recent approvals will permit the approved companies to perform precision aerial surveys, inspect flare stacks for oil in the Gulf of Mexico, survey construction sites, and to map rural areas. This announcement comes just days before the first Commercial UAV Expo is to take place in LA. That expo is to "serve a growing community of entrepreneurs, professionals, and enthusiasts designed to inform, educate and discuss how this technology can be better and safely utilized for business, health, public safety, urban planning, entertainment, and other commercial purposes." Also this week, Amazon wrote a letter to the FAA stating that as it researches the viability and use of drones to deliver goods, if approval is not quickly granted to conduct that research domestically, it will begin developing the technology overseas. 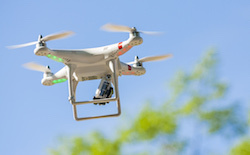 This letter follows previous correspondence voicing concerns about the potentially burdensome regulations of requiring drones to be flown by licensed pilots, albeit remotely, instead of automatically, as Amazon foresees the technology unfolding. The last of a trio of recent UAV news is an announcement from the FAA about how many midair collisions were fortunately near misses. The FAA reported that pilots and air traffic controllers have made the FAA aware of 25 separate near collisions between aircraft and UAVs. This report is central to the FAAs challenge in designing regulations and airspace that protect both aircraft carrying people and UAVs. As this Quora answer says, "the fundamental basis of separating aircraft in our skies is visual - the so-called 'see and avoid' concept..." The problem with simply incorporating UAVs into the current guidelines is that "there's nobody aboard a drone to do the seeing, so they can't legally operate..." in the current status of regulations. The author goes on to discuss that even IFR (instrument flight rules), in which aircraft are in the clouds and rely on air traffic control for directions and separation from other aircraft would be impractical for application to UAVs. There are three reasons for this impracticality. First, UAV operators don't fly current routes: from airport to airport; UAVs want to go somewhere to do something, like over a field to take photos. Second, many UAVs are too small for radar to detect and monitor. Third, IFR rules still attribute responsibility of seeing and avoiding other aircraft on the pilot. In sum, this is such a rich area that is developing so quickly. Each day there are new reports on users and operators seeking approval, the FAA granting this or that, the NTSB finding authority for some regulation, and companies announcing new products despite the fact the products push the boundaries of current regulations. It's hard to keep up, much less predict where this is all going.